They are married with two adult children. 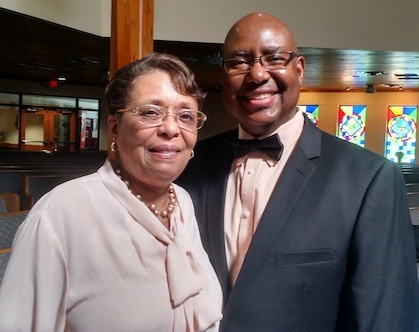 Both Yolanda and W. D. came out of the denominational world over 30 years ago. Although they went to the same high school and the same University, they met while they were at the Church of Christ on Beecher Street in Cincinnati, Ohio. Yolanda and W. D. have taught both adult and children’s Bible classes together. They have been active members of a number of congregations around Ohio. W. D. has preached in Cincinnati; Akron; Columbus; Heath, Lake City, TN; DeQuincy LA, and Lake Charles, LA. W. D. was a deacon for approximately 7 years at the Southgate Church of Christ in Heath, Ohio. Yolanda holds Bachelor’s degrees in Microbiology and in Pharmacy. She is a Pharmacist by trade. Her hobbies include scrapbooking, singing, crafting, and serving others. W. D. holds a Bachelor’s degree in Finance and Management and a Master’s degree in Business Administration. He is an insurance Claim Team Manager whose hobbies include biking, reading, listening to many genres of music, fishing, hunting, learning, teaching, and serving others. Both Yolanda and W. D. were barely born during the Civil Rights movement, but they remember enough about the struggle to remain passionate about working for justice today in Columbus. Like Martin Luther King, they quote Amos 5:24 as a key scripture. “Let justice roll down like waters, and righteousness like a mighty stream." The Genessee Avenue Justice Ministry seeks to serve, help, and assist those in our community who have been wronged, oppressed, or treated unfairly. We seek to hold unjust systems and officials accountable. We lend our voices as advocates for those without a voice, those who are marginalized and left behind in our city and county. God gives us our marching orders in Micah 6:6-8 and Matthew 23:23-24 where we are told that we are to practice “Justice, Mercy, and Faithfulness”. In Nehemiah 5:1-13 God also gives us an example of how to get public officials and powerful systems to do what is right. So, like the cupbearer to the king, we listen to the problem, we identify the nobles and officials responsible, we call a great assembly, we demand justice, and we follow up to make sure the officials do as they promise. Defend the poor and fatherless; Do justice to the afflicted and needy. The Genessee Justice Ministry connects with justice minded citizens across central Ohio to win solutions to larger and larger problems. These congregations make up the organization called “Building Responsibility Equality And Dignity” (B.R.E.A.D.). The vision of Genessee’s leadership and each congregation in B.R.E.A.D is 52/1. In other words, we strive to have our average worship attendance (52 times per year) to show up and use our people power at the Nehemiah Action Assembly 1 time per year to do justice. 52/1. Over the years, we have tackled issues such as crack houses and abandoned properties, disparate treatment in our education system, payday lending abuse, inequity in public transportation, lack of affordable housing, lack of access to mental health care, and much more. To learn more about the Genessee Justice Ministry contact one of our Justice Ministry leaders: James Wynn, Mike Dailey, Theresa Hatcher, or co-chairs Yolanda Smith and W. D. Smith.